Developed for commercial and industrial refrigeration cooling applications with positive temperatures such as air conditioning or industrial process cooling. Optimized for R407F/C and R134a refrigerants. For commercial and industrial refrigeration cooling applications with medium temperatures, such as supermarket or industrial process cooling. Optimized for R407F and R134a refrigerants, with a single pass counter current design. Designed for R134a applications, Pure Cooler ensures the most accurate performance for high efficiency cooling systems and chillers. The Alfa Laval FEV is a high-performance flooded evaporator for air conditioning and industrial refrigeration systems. The flooded evaporators are utilized when operation with closer temperature approaches than that provided by dry expansion evaporators is required. Evaporation temperatures range from 0°C to +10°C. 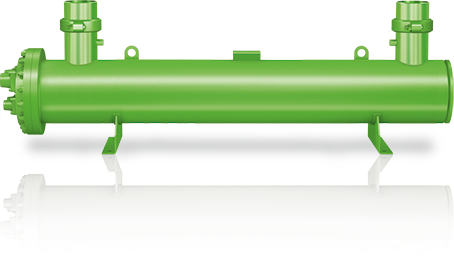 The Alfa Laval FEV has been optimized for R134a and R1234ze refrigerants at low pressure. Capacity range 250 – 5000 kW. PED/CE, ASME and SELO pressure vessel codes are available.